As large breeds, weight management is critical to keep the spine and joints healthy. Bargain foods often contain cheap fillers that only add empty calories to your dog’s diet, making it difficult to maintain a proper weight. Irish Wolfhounds are magical dogs. At once dignified and mysterious, they’ve long been defined through their status as the tallest dog breed and their serene dispositions. They’re recovering big game hunters content to spend their modern lives lounging with the people they love most. They’re highly graceful with the patience of a saint, but at around 130 pounds, they’re still a significant commitment. Large breed dogs have particular health concerns you must consider when deciding what to feed them, so make sure your Irish Wolfhound has the best chance at a quality life by feeding it the right food. Let’s take a look at what that entails. Densely nutritious food gives your Wolfhound all the proteins and carbohydrates it needs to build strong muscles and maintain energy levels throughout the day without adding those extra calories. You may save money in the short term with bargain foods, but in the long run, you’ll spend a lot more on vet visits and treatments for preventable health conditions. Large breeds have their own particular health issues associated with their size. Irish Wolfhounds also have some health concerns specific to the breed, but it’s essential that you watch out for these three common yet dangerous conditions. Irish Wolfhounds, like most large breed dogs, are prone to a potentially fatal condition called Bloat. This condition happens when the stomach distends and twists, causing pain and eventual death if not treated immediately. We aren’t sure exactly what causes bloat to begin, but quality food could play a part in prevention. Dense nutrition can reduce portion sizes and help you feed your Wolfhound smaller meals throughout the day while maintaining energy levels. It can also help ease the strain of digestion through quality pre- and probiotics. Another condition common in large breed dogs, Dysplasia of the hip and elbow is a common condition found in Wolfhounds. Genetics determines whether the condition is present but a diet focused on the needs of large breed dogs can help alleviate the effects. Food should control your Wolfhound’s weight carefully without sacrificing the protein needed to build strong muscles to support the large frame. Managing weight and maintaining muscle tone could be two of the most critical factors in alleviating the stress on the hip or elbow joint and prevent the worst effects of dysplasia. Irish Wolfhounds are naturally very lithe with a lower body fat count than that of breeds somewhat comparable in size. It makes them less tolerant of anesthesia and more likely to feel the effects of any unnecessary weight gain through exacerbating dysplasia symptoms, straining the spine, and developing conditions like diabetes. Properly nutritious foods prevent puppies from growing too quickly like they do on high-calorie diets and help adults maintain muscle mass without adding pounds. The quality of food helps keep weight at proper levels through all stages of life, preventing some of the worst effects of large breed genetic conditions. Quality foods should have proper protein sources from the whole ingredient such as deboned chicken or salmon. These ingredients give your dog the best building blocks for healthy muscle mass. Combined with complex carbohydrates that won’t spike your Wolfhound’s blood sugar, this can be a critical combination for ensuring energy throughout the day. Whole veggies and fruits provide critical fiber counts that keep digestion smooth and weight under control. They contain essential prebiotics as well that cause gut flora to flourish. Antioxidants support the overall immune system and help your dog stave off inflammation responses. Essential fatty acids are critical for brain development in puppies and help keep the skin and coat healthy. As your Wolfhound ages, they also help maintain cognitive functions. Glucosamine and chondroitin are other supplements that help repair and cushion joints alongside those fatty acids. Bargain foods are full of cheap fillers designed to bring down the price of the food, and that spells bad news for your Wolfhound. These foods offer nothing but empty calories and the possibility of allergic reactions that compromise wellbeing. Two frequent offenders are corn and soy, which shouldn’t be listed anywhere in the ingredients list of your chosen dog food. Other considerations would be artificial colors and flavors designed to mask nutritionally vacant foods. Chicken by-product meals can also cause reactions and are a poor source of protein. Be sure you don’t find any of these products in the ingredients lists either. A common way to provide a source of complex carbohydrates in place of ingredients like corn is using potatoes, peas, and legumes. Preliminary research shows a tentative link between these ingredients and a condition called Canine Dilated Cardiomyopathy. Until we understand the connection better, we recommend talking to your vet and avoiding foods with these ingredients in the first two or three positions on the list. A few very common dog brands found on the bargain aisle of big box stores could be causing significant issues with your pet. While there are numerous brands out there to avoid, here are the big three. Ol Roy: A Walmart brand with small prices and huge quantities. What it doesn’t have a huge amount of is nutrition. Corn and soy plus by-product meals make this food full of empty calories. Kibbles N Bits: This is a shelf standard, but it doesn’t give your Wolfhound much more than corn and soy products, artificial colors and flavors, and by-product meals. Basically, everything we tell you to avoid. Alpo: Alpo falls under the Purina brand, and while it’s primarily a wet food with heavy artificial flavors and colors, it also produces two dry foods that use all of our cheap fillers on the list. Plus, the number of recalls should be plenty to deter you. Consulting your vet is a big part of helping you decide on how best to feed your Wolfhound. There are some general recommendations, however, so you can get an idea of what it takes to feed the tallest dog breed in the world. Puppies: Wolfhound puppies need carefully controlled growth to prevent issues with joints and bones later. Your vet is likely to change feeding recommendations quickly to adjust to a puppy’s quick maturation period. Adults: Wolfhounds don’t need as much protein as active working dogs because very few are working nowadays. Keeping protein levels at 18% or under is a good option as well as feeding several smaller meals per day. 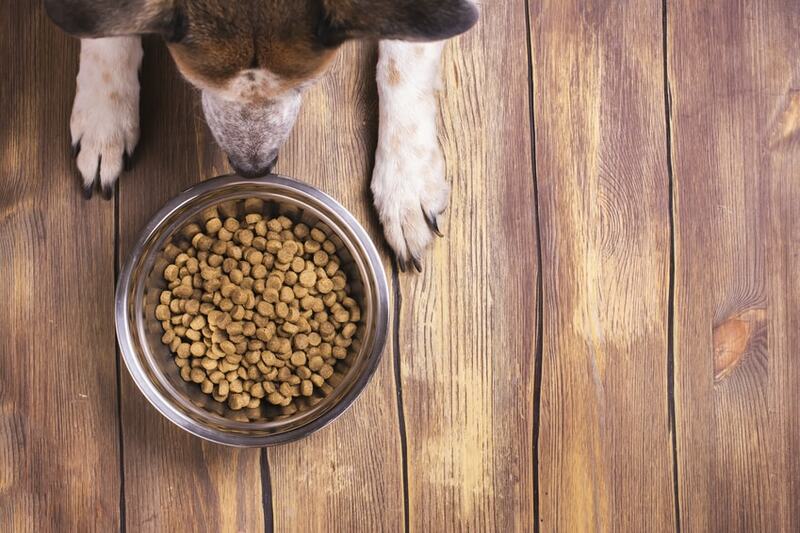 Seniors: Seniors will receive similar portions as they did when they were younger, but your vet may decide to cut back on portion size a little bit to account for inactivity if your pet is showing signs of weight gain. Your Irish Wolfhound needs a proper mix of nutrients without any added fillers so that weight is maintained, and stress is taken off tender joints and bones. Let’s take a look at our top picks for the best food to feed your Wolfhound to give it lifelong health. Honest Kitchen uses a dehydrated form of food that allows cooked, human-grade ingredients without the hassle of cold storage. The Whole Grain Chicken recipe uses deboned chicken as a lean source of protein along with slow release carbs in the form of whole grains. Whole fruits and veggies support skin and joint health through their easy to mix meal servings. Honest Kitchen knows you want to feed your Wolfhound the best food available, but it’s hard to keep foods in cold storage. The company’s dehydrated options are an alternative to messy raw food diets and the empty calories of cheap kibble. The boxes are easy to store and reconstituting the food is meant to be simpler than even hauling around dog food bags. Solid Gold’s lamb formula uses complete proteins from lamb and complex carbohydrates from brown rice and barley without spiking your Wolfhound’s blood sugar, providing give energy all day long. Whole fruits and veggies provide vitamins and antioxidants, plus healthy fats and no fillers. Solid Gold started with a woman’s dream to feed her dogs the best food she possibly could. It’s now a trusted, holistic brand providing premium nutrition for your dog regardless of life stage. Your Wolfhound would really thrive on a cooked food diet, and that’s just what NomNomNow provides. It uses human grade ingredients prepared in NomNomNow’s kitchens. Servings are shipped out each week ready to be served or stored in your freezer. Whole proteins plus fresh fruits and veggies provide excellent nutritional support in convenient packaging. NomNomNow was created by a veterinarian who wanted to provide high-quality nutrition for pet owners everywhere. The company’s kitchens take care of preparation, delivering home-cooked meals to your Wolfhound in convenient serving sizes, and all deliveries and recipes can be managed directly from the website. Puppies change pretty rapidly during their journey to adulthood, so it’s important to discourage growth that’s too fast with a food made for large breed puppies. This allows them to grow at a pace that won’t stress joints and bones, giving them a better start at overall health. Wellness’s large breed recipe is designed with your Wolfhound in mind. It prevents rapid growth with carefully controlled protein and calories, plus plenty of fatty acids for brain development and skin health. It also uses a supplement to try to stave off the smell of puppy stools. Wellness uses only premium ingredients to provide a holistic approach to pet nutrition, and they were one of the first to do so. It’s high-quality nutrition for long-lasting health for your Wolfhound no matter the life stage. Nulo proves you can have both wet food and food specifically for your large breed. It uses carefully controlled calories to prevent rapid growth and is grain free to help with sensitive tummies. It’s suitable for puppies who’ve just weaned to help them get used to solid foods. Nulo considers your large breed puppy’s needs with ingredients intended to build strong muscles without encouraging rapid growth. The company provides densely nutritious foods previously only available at specialty stores and now available widely for all pet owners. Seniors need similar nutrition as their younger counterparts but controlling weight is your first mission. You want to make sure your senior stays trim so they can enjoy life for as long as possible without losing the ability to move. Now Fresh’s weight control formula uses carefully controlled calories with whole proteins to help your senior stay at the ideal weight. It includes glucosamine and chondroitin from natural sources to provide joint support and essential fatty acids to keep cognitive function in top shape. Now Fresh uses premium ingredients to create a high-quality kibble that’s as close to your Wolfhound’s ancestral diet as possible. It has plenty of protein and supplements to help your senior Wolfhound maintain a high standard of living even in the twilight years. Victor also uses a healthy weight formula to prevent extra pounds from robbing your Wolfhound of its golden years. It uses an excellent ratio of fat and protein to support your senior dog’s aging process, along with ingredients to support digestion and immune functions. Victor uses almost exclusively locally-sourced ingredients in its dog foods, with only 20% of ingredients coming from outside a 200-mile radius to its Texas home base. It’s a premium food designed to give your senior the best nutrition available for a more affordable price than some other premium brands. Feeding your Irish Wolfhound doesn’t have to be a headache. Going with foods specifically intended for larger breeds, plus food that has a lower overall protein and fat content can help your Wolfhound maintain weight and protect joints. Premium foods give your Wolfhound all the nutrition needed for daily energy. Choosing more expensive food over a bargain food may not make your wallet happy in the short term, but you may end up spending less time and therefore less money at the vet later. Go with nutrient dense and give your Wolfhound the best years you can.